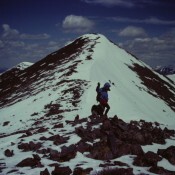 Climbing and access information for this peak is found on page 257. 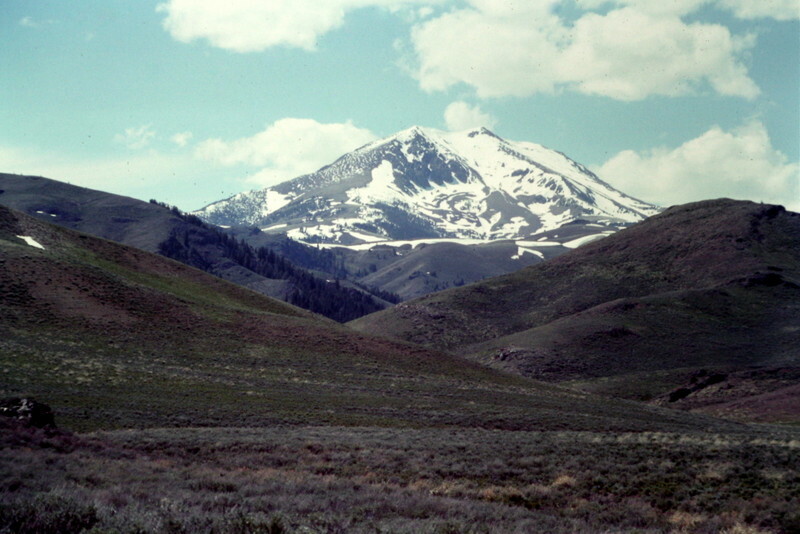 Smiley Mountain dominates the southeastern end of the Pioneer Mountains. 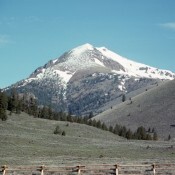 The Antelope Creek Road and the peak’s south ridge are snow free early in the spring allowing for early season access to the peak’s south ridge. 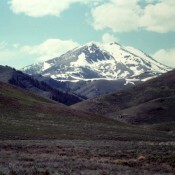 The climb from the road will gain around 3,600 feet in 4.0 miles. 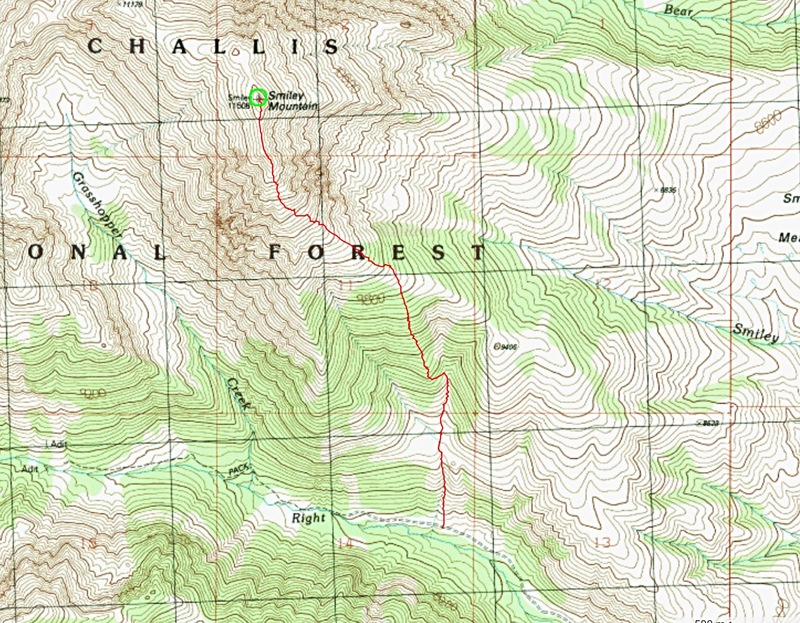 This route is used by most climbers. Livingston Douglas’ North Ridge Route is found below. Smiley Mountain. The south ridge viewed from Antelope Creek runs from the summit down the middle of the photo and then curves off to the right. Date of Climb: 7/2/16. Note: This climb was done in combination with a ridge traverse from Peak 10995/Double U Peak and Peak 11151/The Ramp. From the Lake Creek Trailhead (8,050′), hike up the trail/ATV road just shy of 6 miles to the road’s end in an open area west of Round Lake, on the west side of a creek with substantial flow. The elevation here is 9,400′. The Smiley Mountain quadrangle doesn’t show the dreadful terrain that lies between you and Round Lake. Thick willows and deep marshes (plus two creek fords) block your access to Round Lake. This awfulness also surrounds the south side of Round Lake (also not shown on the USGS quad), so circumventing Round Lake by skirting the south side of it is NOT an option unless, perhaps, you’re a moose or a Bigfoot. The only feasible option is to find higher ground upstream and to traverse east from there. I cannot overemphasize how marshy this area around Round Lake is. It’s really incredible. Follow the right/west side of the stream south for 1/4 mile, gaining only 100′ in elevation en route. But that’s enough to get you to dry ground. Cross the stream and bushwhack east up through easy forest, finding some small marshes and ponds up here (!) to work around. Traverse upward to treeline at the base of the prominent cliffs of the west face of the north ridge of Smiley Mountain. You will eventually reach a large, gentle basin at 9,550′. It is now decision time. From this basin, you can climb Peak 10995 to the north, Peak 11151 to the east, or Smiley Mountain to the south. 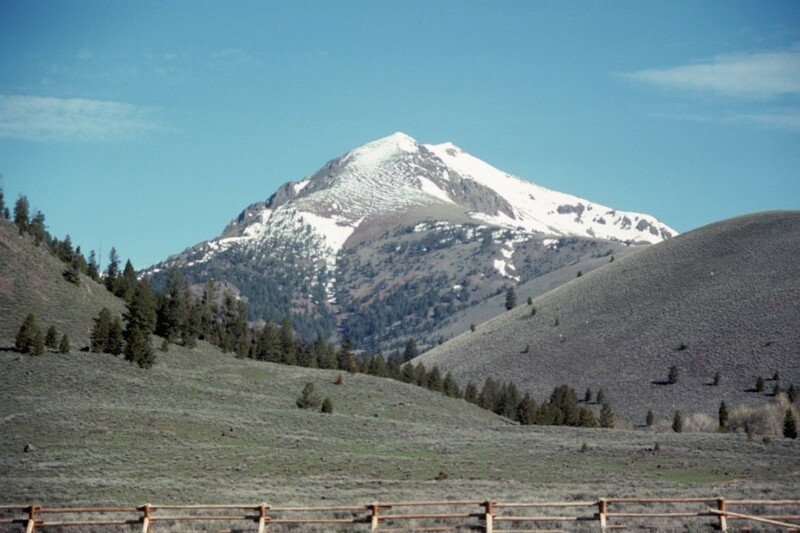 Or, if you are really a glutton for punishment (as I was), you can climb all three today. Let’s focus on Smiley Mountain for now. 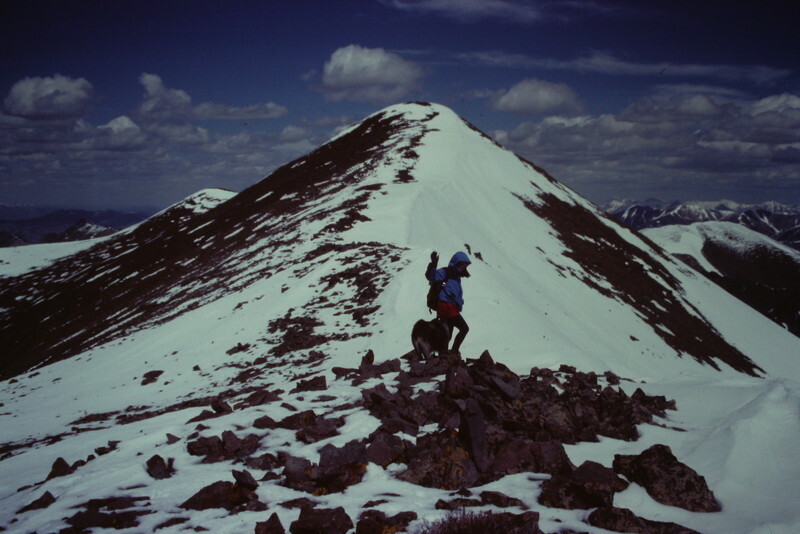 From the 9,550′ basin, scramble south up easy scree to reach the North Ridge of Smiley Mountain. Follow the ridge south to Point 11179, skirting its east side on goat trail. Continue up the ridge southeast over Point 11420 then south to the summit of Smiley Mountain. Smiley is just a big pile of choss with a USGS BM on top. This is an easy scramble, but a LONG one. The scramble up the South Ridge from Iron Bog Campground is much shorter and is recommended if you are only planning to climb Smiley Mountain.